Davidson Realty is a drop-off location for Tools 4 Schools’ Supply Drive. Our schools are in need of every-day items such as backpacks, crayons, paper, student scissors, calculators and more. 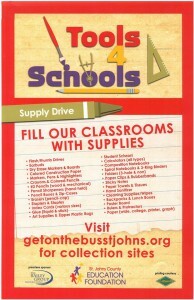 To see the full list of needed supplies, please visit www.getonthebusstjohns.org. Help fill our local schools with the supplies they need all school year long! Amazon.com has just launched AmazonSmile, a program created to donate a percentage of any purchase made on Amazon to the charity of your choice at no cost to you! It’s as simple as visiting https://smile.amazon.com/ch/46-0918130 and shopping! AmazonSmile offers the same selection of products and low prices with the added bonus of a percentage of your purchase price going to the schools. It’s also available for Amazon Prime users, so get shopping! Lastly, mark your calendar for Davidson Cares’ 3rd Annual Novemberfest Fundraiser on Friday, November 7th at Davidson Realty’s office building located at 100 East Town Place, St. Augustine, 32092. The event begins at 7 pm and every penny raised goes directly to the schools. 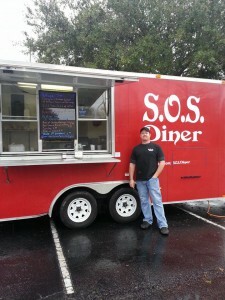 The event is always a hit with delicious craft brews, great food, awesome raffle items, live music and more! For more on Davidson Cares or helping our schools please visit www.davidsoncares.com or call Peyton Davidson at (904) 940-5000.